Lead Sources are used to identify each of your business generating sources. These sources might include newspaper advertisements, flyers, and referrals. To access Lead Sources Master Files from the menu bar of the main TeleTracker Online screen, click Master Files, then Lead Sources. To create a new Lead Source, click on New button located on the toolbar. 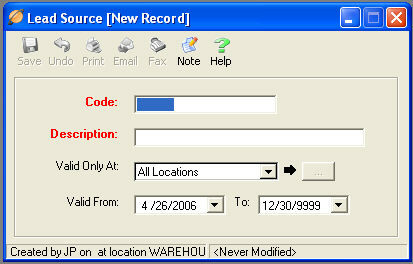 To open an existing Lead Source, select the Lead Source from the Lead Source Master File list and click the Open button. Code : This field is the unique name used to identify each individual Lead Source. Description : This field is used to further describe your Lead Source code. Valid Only At : Select the appropriate location(s) for which this Lead Source is valid. Valid From Valid To : Select the appropriate dates for which this Lead Source will be valid. Creating and utilizing Lead Sources throughout TeleTracker Online will identify your greatest revenue generating sources as well as provide reporting useful in the planning of your marketing budget. Look for the Lead Source Group By option on the Profit / Loss Reports. This will group your profits by each Lead Source so you can easily recognize your most valuable business generating sources.